The Charlie Hebdo incident: we cannot not sight it and refrain from all comment. It would be redundant to revisit here the obvious aspects of the incident. Thus, obviously, the murderers at the office of the French satirical magazine were simply evil. Obviously, the killers were motivated by their obsession with their version of Islam to do the evil act. Obviously, haters of Islam could be counted on immediately to call for hateful counter-action. They did not disappoint. Obviously, obsessive critics could be expected to trace all the evils to “their” holy book and to discount descriptions of and calls for holy wars in other people’s holy books. What was expected has occurred. Obviously, anyone who spoke up for patience, tolerance, understanding, and positive responses to the evil had to be ready to be dismissed as vapid, naïve, and blind excusers of evil. Five “obviouslys” should suffice. Some other voices revealed how difficult it is to go beyond the obvious, but they tried. The most interesting of these were those who addressed some rationales and motives of the killers and their spiritual kin. Thus Bill Donohue of the Catholic League issued a release captioned, “Muslims Are Right to Be Angry.” To the point: “We,” he wrote, should not “tolerate the kind of intolerance that provoked the violent reaction.” Donohue was predictable, but one can understand his emotional response. “Charlie Hebdo” wanted to taunt and outrage believers in other faiths than Islam, notably Judaism and Catholicism, both of which have their own defense leagues. You don’t have to be a Catholic or to be offended by the paper’s cartoons picturing nuns masturbating or popes wearing condoms. Becoming concerned with evils that do “damage to our souls” might be one positive response to come out of the crisis in which we measure “their” evils against ours. Anyone who reads “Comment-section” responses to internet coverage of this topic will encounter myriad vengeful, hateful, also-blasphemous verbal swings at reverent citizens minding their own business. Some who comment do express proper gratitude for the non-lethal or, at least, less lethal expressions, and credit Western democracy for providing us with forums which protect blasphemers. The moment calls for new appreciation for those polities we enjoy which have encouraged inter-group civility, threatened though that may be in these days of hyper-polarization. But people in our citing and commenting vocations can also use the moment to recalibrate our measures of outrage. In 1988 when we were chartered to begin a multi-volume, multi-year, multi-religious study of fundamentalisms, a historian of the domestic versions of such helpfully reminded us editors that, as we study militant and belligerent religious movements and forces, we should remember that “there are no guns or bombs stored in the basement of Moody Bible Institute.” The Moody Bible Institute, a stronghold of latter-day American now-moderating fundamentalisms, is visible from my windows. I have never felt threatened and do feel welcomed. “We” cannot solve all the problems at the core of the present tragedy, but those who ask us to begin at home to promote understanding do serve the cause. They may sound weak. They are strong. Donohue, Bill. “Muslims Are Right To Be Angry.” Catholic League For Religious and Civil Rights, January 7, 2015, 2015 News Releases. http://www.catholicleague.org/muslims-right-angry/. Ohlheiser, Abby. “#JeSuisCharlie: Cartoonists react to the Charlie Hebdo massacre in Paris.” Washington Post, January 7, 2015, Comic Riffs. http://www.washingtonpost.com/news/comic-riffs/wp/2015/01/07/cartoonists-react-to-charlie-hebdo-massacre-in-paris/?wpisrc=nl_pdmwk&wpmm=1. Lerner, Michael. “Mourning the Parisian Journalists Yet Noticing the Hypocrisy.” Tikkun, January 9, 2015. http://www.tikkun.org/tikkundaily/2015/01/09/mourning-the-parisian-humorists-yet-challenging-the-hypocrisy-of-western-media/. Cole, Teju. “Unmournable Bodies.” New Yorker, January 9, 2015, Culture. http://www.newyorker.com/culture/cultural-comment/unmournable-bodies. Saffa, Ozzie. “‘Dangerous Moment’ for Europe, as Fear and Resentment Grow.” Ozzie Saffa Blog, January 8, 2015. http://ozziesaffa.blogspot.com/2015/01/dangerous-moment-for-europe-as-fear-and.html. Schuessler, Jennifer. “Charlie Hebdo Attack Chills Satirists and Prompts a Debate.” New York Times, January 9, 2015, Arts. http://www.nytimes.com/2015/01/10/arts/an-attack-chills-satirists-and-prompts-debate.html?_r=1. Kristof, Nicholas. “Is Islam to Blame for the Shooting at Charlie Hebdo in Paris?” New York Times, January 7, 2015, Opinion Pages. http://www.nytimes.com/2015/01/08/opinion/nicholas-kristof-lessons-from-the-charlie-hebdo-shooting-in-paris.html. Krule, Miriam. “Charlie Hebdo’s Most Controversial Religious Covers, Explained.” Slate, January 7, 2015, Browbeat: Slate's culture blog. http://www.slate.com/blogs/browbeat/2015/01/07/charlie_hebdo_covers_religious_satire_cartoons_translated_and_explained.html. Peters, Justin. “Charlie Hebdo Cartoons: Yes, its depictions of Islam can be odious, but they belong to a tradition that's as French as champagne.” Slate, January 9, 2015, Foreigners: Opinions and Events Beyond Our Borders. http://www.slate.com/articles/news_and_politics/foreigners/2015/01/charlie_hebdo_cartoons_the_anti_clerical_newspaper_tradition_that_s_as_french.html. “Paris attacks: Millions rally for unity in France.” BBC News, January 11, 2015, Europe. http://www.bbc.com/news/world-europe-30765824. Alderman, Liz. 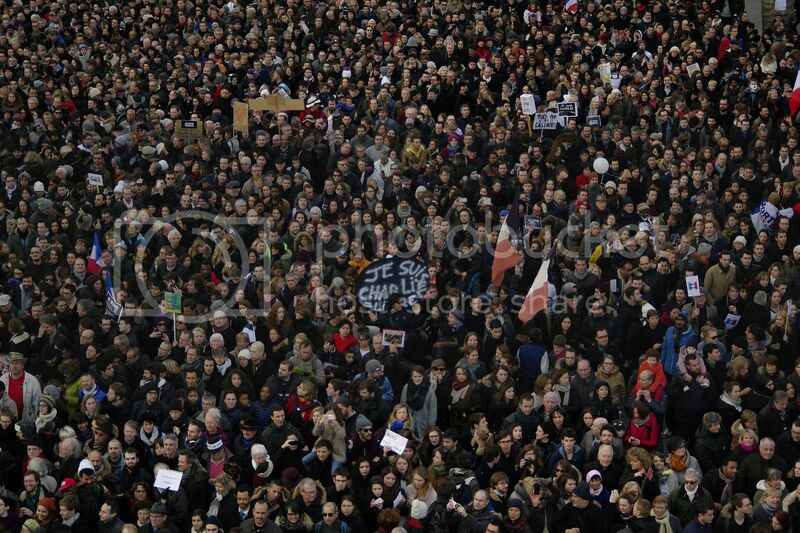 “Huge Show of Solidarity Against Terrorism in Paris.” New York Times, January 11, 2015, Europe. http://www.nytimes.com/2015/01/12/world/europe/paris-march-against-terror-charlie-hebdo.html?hp&action=click&pgtype=Homepage&module=a-lede-package-region&region=top-news&WT.nav=top-news. Martin, Marty E. and R. Scott Appleby, eds. The Fundamentalism Project. Chicago: The University of Chicago Press, 1994-2004. http://press.uchicago.edu/ucp/books/series/FP.html. Image: Rally at the Place de la Republique, Paris, January 11, 2015. Credit: Antoine Walter / flickr creative commons. To comment, email the Managing Editor, Myriam Renaud, at .